Know someone who's never experienced Fable, or has only played Fable 3? Get them on this. "You must be able to get rid of him somehow," says the beggar of the bully, "anything'll do. Use your imagination." I'm a young warrior fresh out of Hero training, and this is my call of duty. I face the assailant, lift a muscled leg, and let one rip. When Fable first came out ten years ago, its sense of humour set it apart. Here was an action-RPG with monsters to fight, and weapons and magic with which to fight them, but which also let you give people the finger and unlock Boasts by carrying out a quest naked. It was quintessentially British, from its regional accents to its refusal to take itself too seriously. Sure, the protagonist was a typical hero chosen in boyhood and trained for greatness, but there was no pressure to rush out and fulfil a destiny to save the world. He could use his training however he wanted. He could afford to take some time to fart on bullies. Ten years later, with an HD facelift and the word 'Anniversary' stuck on the end of its name, Fable is still funny. I still laughed when I came across my first loot and was told "The people of Albion like nothing more than hiding their treasures inside wooden chests," because games haven't moved on enough in the past decade to make that quip irrelevant. We're still fighting nameless bandits, carrying out fetch quests, and finding treasure hidden in plain sight. One advantage of the relative lack of progress in games this past decade is that it didn't take much adaptation to make Fable Anniversary playable in a way that some remakes of classics just aren't. Baldur's Gate: Enhanced Edition's UI might be... enhanced, but it's still incomprehensible to me. Aside from a few fiddly menus, however, Fable Anniversary feels natural. I favoured mouse and keyboard, particularly when using a bow and arrow to pop an enemy's head off, but you can also play with a controller, and this remake even adds a Fable 2/3-inspired control scheme. The combat might feel simple, but the ability to switch between Strength (melee), Skill (ranged), and Will (magic, in a range of unlockable forms) keeps things varied, and a combat multiplier that awards bonus experience and abilities encourages more strategic play. Boss battles are a typical cycle of avoidance and gradual damage, but games have hardly left that in the past yet either. My only real frustration was with the targeting system, though that turned out to be most irritating outside of combat, when I was escorting three merchants through a swamp and had to repeatedly target and command each of them in turn. Many of the side quests are similarly mundane, which is another way games have hardly changed since 2004, but they're most interesting for the part they play in the morality system for which Fable is known. Its polarity - protect the farm or attack it - might seem farcical, but it's part of that self-referential humour as the Hero grows a halo or horns, and unlocks the ability to do a Disco Dance or a Vulgar Thrust. Besides, that binary morality makes it much easier to play through Fable Anniversary again and have an entirely different experience than it is with a game like The Walking Dead. This game's choices are overly simple, but purposefully so. The whole game seems simple compared to its modern-day equivalents, but because those games have built on its formula and haven't yet replaced it entirely it feels more like a blueprint than a basic alternative. The features added to the series after this first entry go largely unmissed. I resented that I had to be male despite Albion's acceptance of female Heroes, but I didn't once wish I had a dog. There's no royal after-game, but I could buy myself a house and attract a wife or husband (or several). The map is relatively small, but its locations have character, and everything looks a lot nicer under the lights and shadows of Unreal Engine 3. Fable Anniversary hasn't added much to the original formula save achievements and a harder 'Heroic Mode', but that's OK. 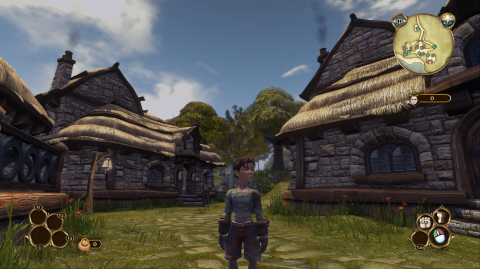 Updated graphics, improved controls, and a new save system were all that was really needed to tweak Fable for modern players. I could give this to my brother and sister who were in nappies when the original came out and know that they could still get something out of it. They might just roll their eyes at the echoey voice of the Guildmaster telling them their health was low, but then kids are so good at games these days they probably wouldn't hear it nearly as much as I did.